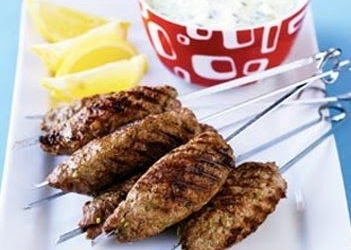 Kefta is a Moroccan food recipe of beef kebabs served with salad. In a large bowl combine the beef, onion, garlic, parsley, coriander, mint, marjoram, salt, pepper, cumin, paprika and cayenne. Cover and let sit for one hour. In a separate bowl, combine cucumber, tomato, bell pepper, hot pepper, garlic, mint, red wine vinegar, olive oil, salt and pepper tossing to combine. Cover and let marinate at room temperature until ready to serve. Wet hands with water and shape meat mixture into 2 sausage-shapes on a soaked wooden skewer. Repeat procedure for remaining meat and skewers. 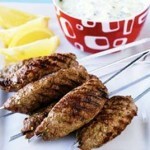 Grill the keftas on both sides until cooked through, about 3 to 4 minutes per side. Serve hot with chopped salad.